I have a wonderful and easy recipe for you today! 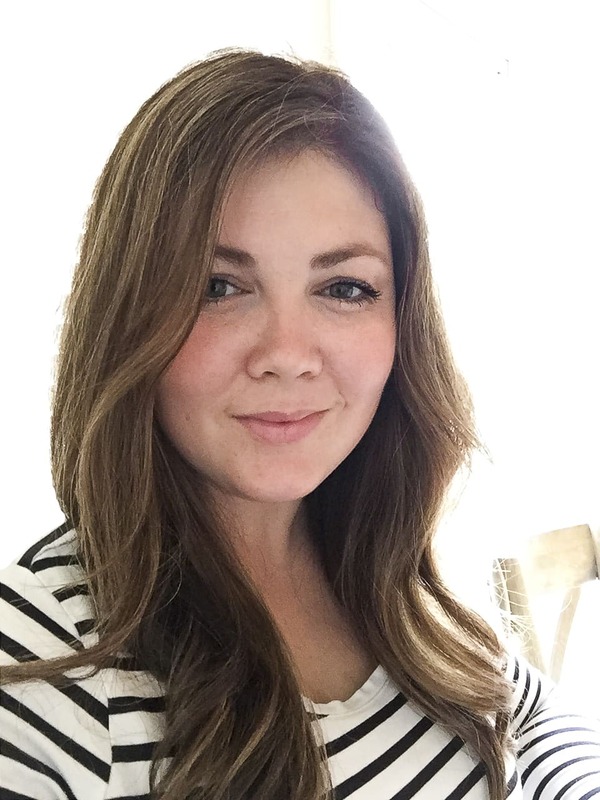 I shared my go-to Easy 10 minute Asparagus recipe a couple of years ago and this is a slight variation of that…. with BACON! I know you will love it. And stay tuned at the end of the post for a bunch of other really delicious recipes as part of a fun virtual progressive dinner. It makes me so hungry to look at all of them! On a side note, I have to apologize for being so MIA these past couple of weeks! I have been a little under the weather but I have some fun projects planned for the next couple of weeks, so stay tuned. 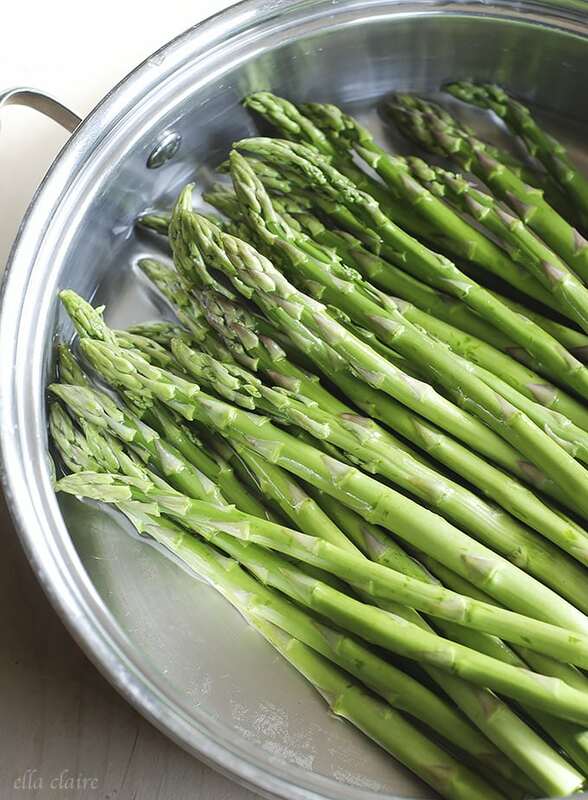 Chop the woody bottoms off of the asparagus and place in a pan big enough so the heads are not bent. The asparagus will be overlapping, but that is completely ok. Add water and a lid, and cook on high 4-6 minutes until asparagus is tender but still firm. Remove from heat and discard remaining liquid. Add butter, garlic salt, pepper, bacon, and grated parmesan cheese and return to stovetop on medium high heat. scrape and toss until butter is melted and parmesan becomes gooey and lightly browned but not burned. Some will stick to the bottom, but trust me that is the good stuff. 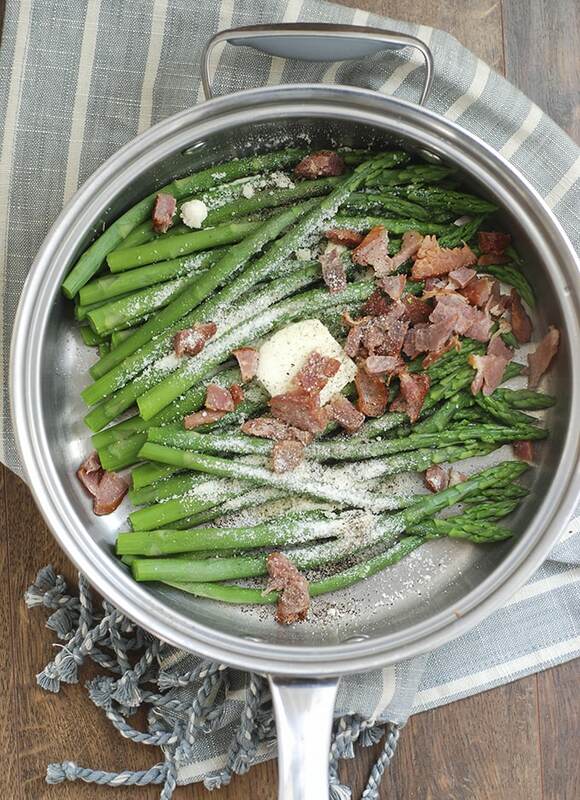 You will want to scrape that goodness off and serve it with the asparagus! Dump onto a pretty plate, sprinkle with a handful of shredded parmesan, and enjoy! Please note: More detailed instructions for the technique I use to cook asparagus can be found HERE. The asparagus is so delicious! 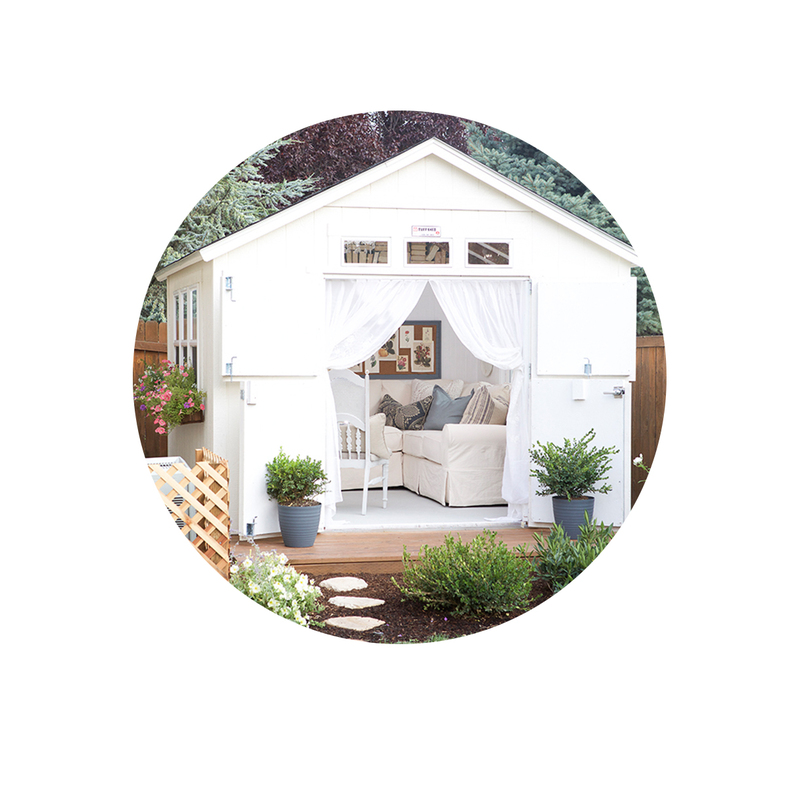 I think you will really love it! 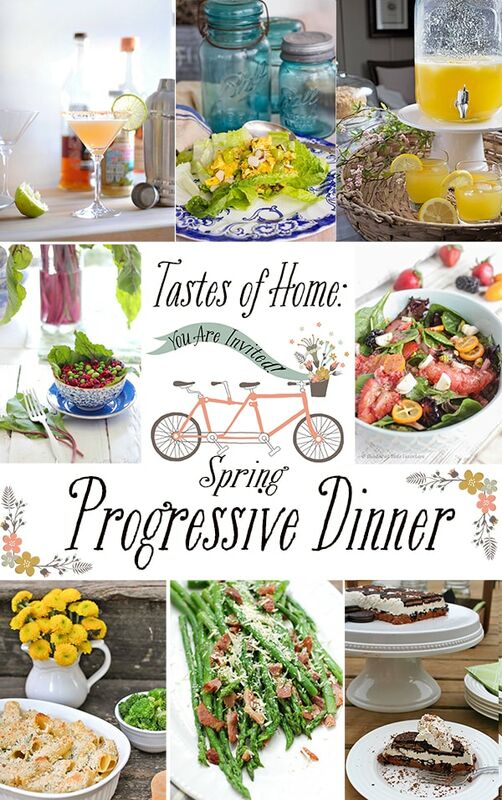 And here are 7 other amazing recipes that are part of our spring progressive dinner! So colorful and delicious. I love this time of year! You had me at bacon–the healthy asparagus is just a bonus 🙂 Can’t wait to try this one–pinned for later! 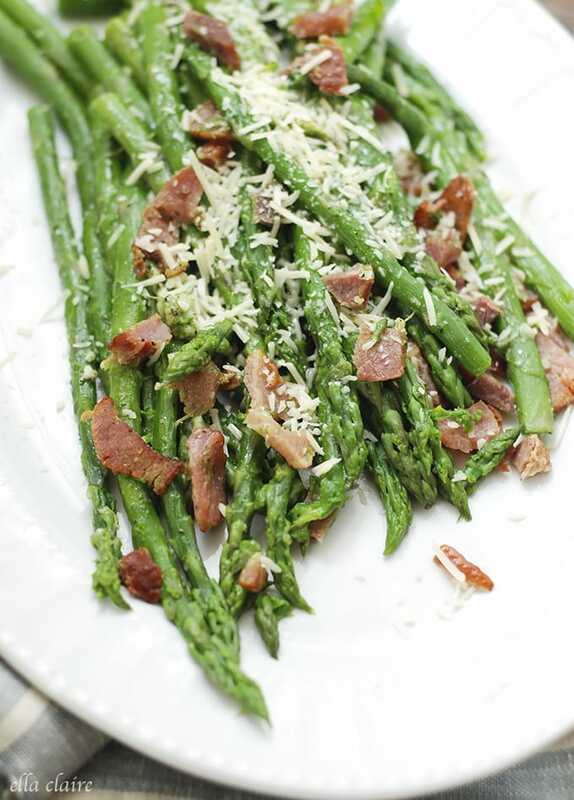 Asparagus is my fave … but I’m a vegetarian and would need to eliminate the bacon. Looks good though!! I adore asparagus!!! Yummy! And with bacon! To die for!